There are many different types of grilled cheese sandwiches. You can pretty much stuff them with any filling, so long as the texture and taste of the ingredients play well together. Same goes for cheese. You can pretty much use any cheese, so long as it is your favorite. There is no right or wrong when it comes to what you like to prepare for yourself and your families. 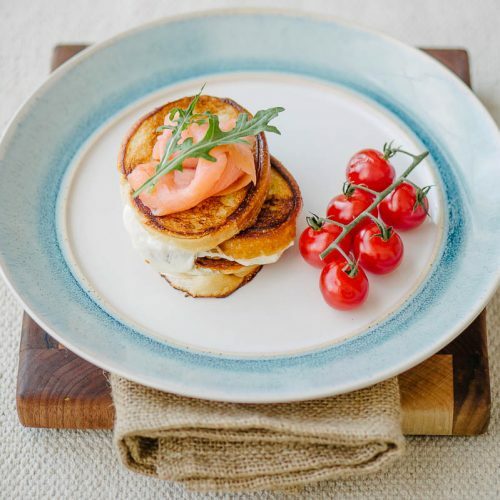 A general consensus is that you need to choose cheese which melts well and has a creamy texture. 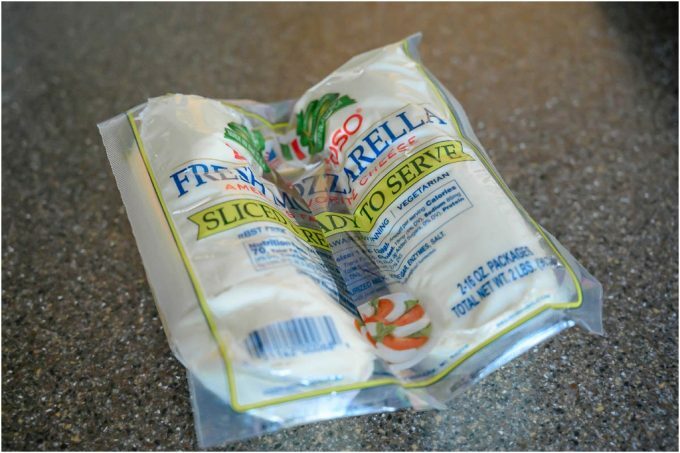 My children prefer mozzarella cheese for their sandwiches and we’ve been making them with mozzarella for some time now. Mexican Oaxaca cheese also works very, very well for this purpose, as it has a very mild, milky flavor and it melts and strings oh-so-well! You can also go with a great slice of cheddar or yellow American if that’s what you like better. The amount of cheese in between the bread slices is important, too. Do not overload the sandwich with cheese. You need the cheese to melt and be ready right about when the slices of bread are caramelized from both sides. For example, if I have 1/2-inch thick slices of mozzarella, I carefully slice it in two (albeit not perfectly uniform slices. No one will test the uniformity of the cheese which goes inside of the two slices of bread). Also, remember that mozzarella is somewhat wet. You do not want a soggy sandwich by stuffing it with a lot of fresh mozzarella. 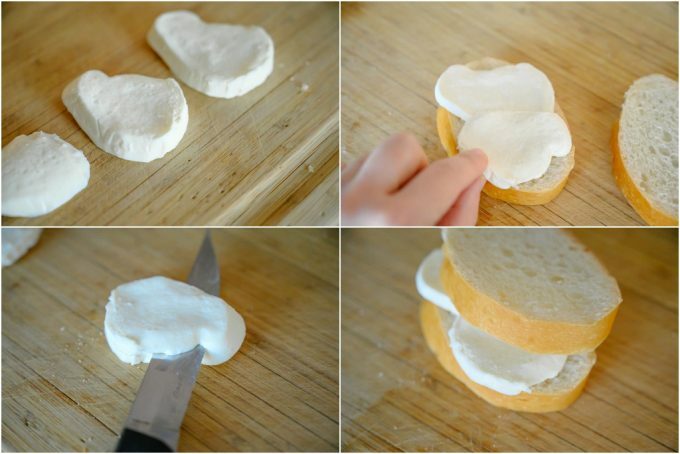 If you are using shredded mozzarella, which is also an option, you can play with the amount of cheese that goes into the sandwiches. Even then, try not to overstuff it. Bread is probably one of the more important factors when it comes to making a successful grilled cheese sandwich. In my mind, Italian or French bread is an exceptional choice for making these sandwiches. I’d like my bread to hold its shape while being grilled and not fall apart. Yet again, it is a personal preference of each person. 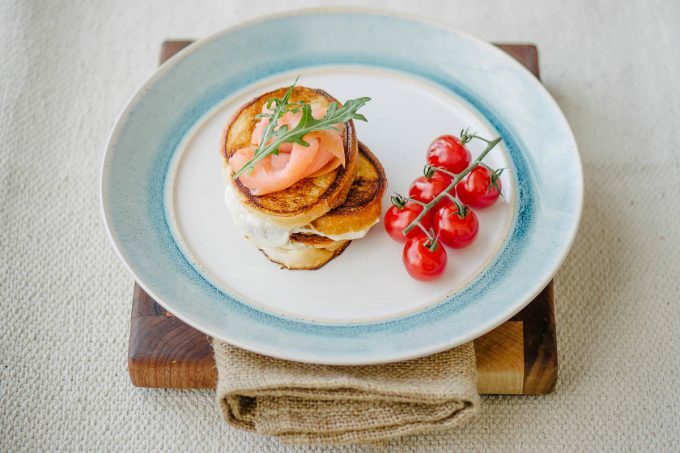 So, in this article, we are going to concentrate more on the technique of making the grilled cheese recipe conventionally, without the toaster or a panini machine. Do pay attention to the thickness of the bread slices, too. Butter is essential in making a crunchy and tasty grilled cheese recipe. If you have some health concerns when it comes to using butter, switch to clarified butter or ghee. Those who are lactose intolerant should do relatively well on ghee because there is virtually no lactose (or maybe very trace amount of it) in ghee. The technique of spreading butter on the pan is no less important. Once you place some butter (or ghee) on the skillet, make sure to spread the butter well before you place the sandwiches. This way you will have evenly cooked and caramelized slices of bread. Use either sliced French bread or slice 1/2-inch slices of bread for the sandwiches. Each sandwich will get 2 slices of bread. If the cheese you have is a little thicker, feel free to slice them gently. Layer the cheese in between the slices of bread. Heat a large (or whatever size) skillet you have. Add 1 Tbsp butter and melt it on Medium-low heat. Spread out the butter for an even caramelization of the bread. 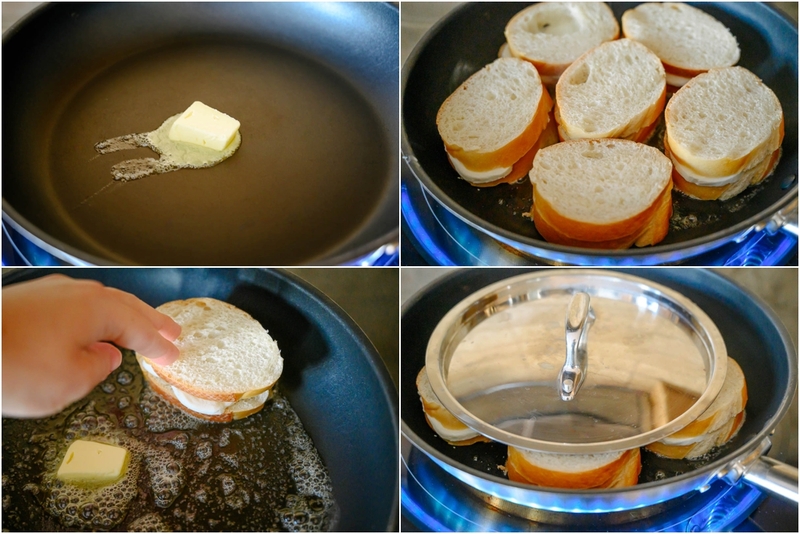 Once the butter has melted, place the sandwiches on the skillet, however many the skillet can handle. I like to cover the sandwiches with a smaller lid and gently press down on it while the grilled cheese sandwiches are cooking. This helps with cheese melting faster and also creates a somewhat thinner and crispier sandwich. 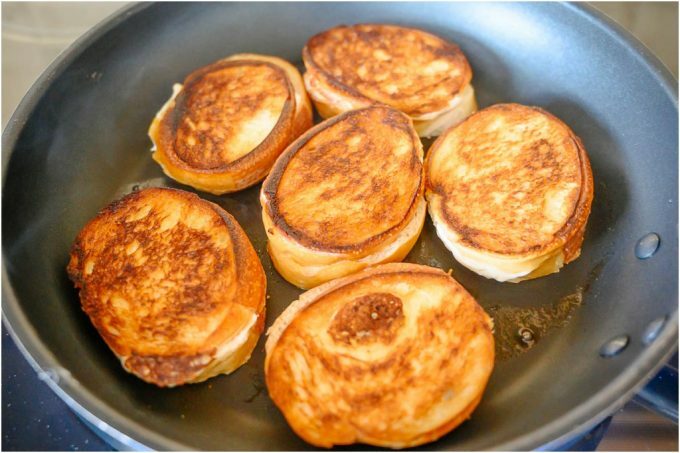 Once the bottom of the grilled cheese turned golden brown, flip them and keep on cooking on that side. If you feel like it, drop a little more butter in between bread and gently spread it out. You can do the lid method again and give the sandwiches a slight press. Once you notice that the cheese is oozing from the sandwiches, Ii is a good indication that the cheese has melted. If both sides of the bread are nice and toasty, the sandwiches are ready. That’s pretty much it! If you have any questions, please feel free to ask me in the comment section. I would love to see what you are making.